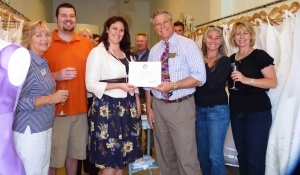 May 13, 2010 (La Mesa) –La Mesa Chamber of Commerce hosted a ribbon-cutting and toasted with champagne this week to celebrate the grand opening of La Mesa’s newest business, Sparrow Bridal Boutique. 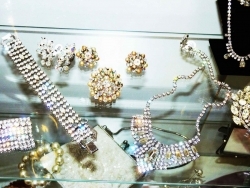 But the dazzling wedding gowns, sparkling jewels and pearls aren’t all new. 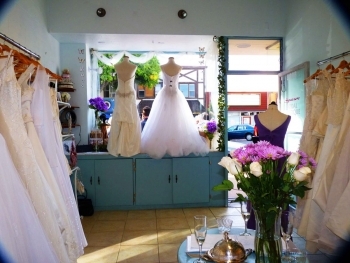 A chic boutique that’s ideal for the bride on a budget, Sparrow carries an array of both new and gently worn gowns, specializing in classic, vintage bridal wear. 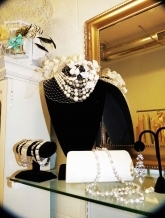 The shop carriesdesigner-label dresses, traditional and bird cage veils, vintage and costume jewelry, fashionable purses, garters and other accessories. After your big occasion, you won't need to box up your gown and stash it away, never to see the light of day for decades. Instead, Sparrow can take in your gown on consignment. Why not put some jingle in your pocket--and enable another bride-to-be to purchase an affordable wedding dress! Sparrow can also help you plan your wedding events including engagement parties, showers, rehearsal dinners and wedding ceremonies. Proprietor Laurie Ohnesorgen, who formerly booked events at Gio’s Wine Bar Bistro before opening up her bridal shop this spring -- just in time for the Easter Sunday earthquake to shatter crystal glasses in the store. Since then, she's gained first-hand experience in all phases of wedding planning—as a newlywed who said her own wedding vows in April. Vintage is always in and I'm not surprised why some brides would prefer a wedding the old-fashioned way. Even sites today offer vintage wedding accessories, one example is TheFeatheredHead.com, they offer vintage fascinators that every bride would love.